You’ve booked your cruise and packed your bags, but are you sure that you have all of the necessary documents? The last thing you would want is to make it to your cruise port in good time, only to realise that you’ve forgotten an important document. Failing to remember an essential document can end your cruise holiday before it’s even begun, so read on to find out exactly what you’ll need to guarantee a smooth boarding and the best possible experience on-board. This is perhaps the most obvious of the documents you’ll need for your voyage, but you’d be surprised at how many cruisers turn up to the terminal without their boarding passes. Most cruise lines offer an online check-in service, so you can enter the required information on the line’s website and print your passes off at home. Make sure to keep them in a safe place and hand them over for inspection as you come aboard to enjoy a hassle-free embarkation. Needless to say, the same applies when you come to catch your flights if you’re embarking on a fly-cruise departing from an overseas port. As with any form of international travel, you’ll need your passport when you embark on a cruise holiday. Every traveller must have their own full passport, and it is highly recommended that you make sure your passport is valid for at least six months after your scheduled return date. It is important to make sure you acquire the correct travel visas before you set sail on a cruise getaway, or you could find yourself confined to your ship while other guests have disembarked to explore in port. While some countries do not require guests to have visas when they come ashore, some nations have stricter rules, which means you’ll have to get hold of the right documents before you embark. Your travel agent or cruise line should make you aware of any visa requirements when you come to book, but if you’re unsure, make sure to check well in advance of your departure date. At the time of writing, some of the most popular destinations which require UK cruisers to obtain some form of visa include India, China, Vietnam, Cambodia, Myanmar, Egypt, Indonesia, Jordan, Oman, Sri Lanka, United Arab Emirates, Australia and Russia. Visas to enter some of these nations may be available to purchase on-board your ship, while others you will need to acquire beforehand. The important thing is to do your research, ask your cruise line or travel agent and make sure you’ve not missed any important visa information. Luggage tags are essential for indentifying your bags during the boarding process. Most cruise lines will take your luggage on-board for you and deliver them straight to your stateroom, based on the information on your tags. Different cruise lines have different approaches to providing you with luggage tags, so make sure you’re aware of your line’s policy. 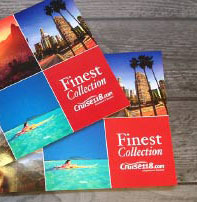 With some cruise lines, you may simply print off your own luggage tags during the online check-in process, while others will send them to you through the post as part of a holiday pack. Sometimes you may even receive you’re tag as you come aboard. If you do receive your luggage tags in advance of your embarkation date, make sure to remember them to avoid any unnecessary hassle when it comes to boarding your ship. Make sure to bring any credit or debit cards with you to link to your on-board account, so you can easily pay for anything you wish to purchase on-board. On-board credit can be spent on a wide range of extras, from speciality dining and spa treatments to casino gaming and boutique shopping. While it is possible to pay for these things in cash, carry large amounts of paper money around with you can be risky, so credit cards offers a much safer and more convenient alternative. While the majority of cruise destinations will not require any vaccinations for safe travel, some more exotic countries will require them. For example, some African and South American ports may require proof of yellow fever vaccination if you have visited a country with yellow fever in the past, so it is important to get hold of this documentation if necessary. Your travel agent should let you know of any vaccination requirements at the booking stage, but if you’re not sure, make sure to get all the details with plenty of time to spare before your set sail.